Recently, I’ve been spying people with letter blocks just sitting in their studios with little mantras that have meaning to them. And while I love the idea of using game pieces such as Boggle or children’s letter blocks, I found these wooden blocks at my local big box and thought I’d create my own. 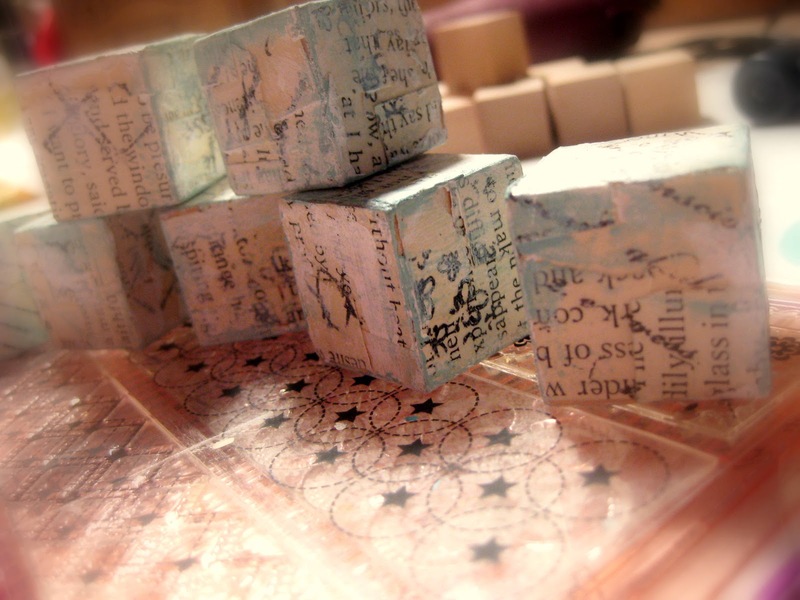 I tore up a bunch of vintage book pages and used Glue N’Seal to decoupage them on all the sides of the blocks. Then I just did a quick little sanding on the edges. For some added texture and design, I stamped some of my favorite go to backgrounds here and there. I am in LOVE with Wplus9 Defining Words and BackgroundI. Because these blocks are smaller, I also used Pattern Craze by Sweet Stamp Shop. 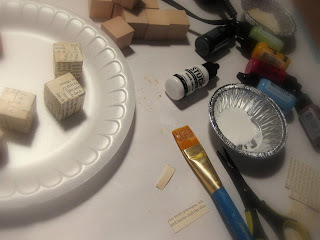 Then I took a bit of the Claudine Hellmuth White paint and with my finger, smeared some paint on all side of each of the blocks. I’m really into the blue/greens these days for my studio décor because my walls are red. I mixed a bit of the Claudine Hellmuth Sky and Landscape Green. Now why didn’t I use the Teal….well, that is simple…I couldn’t find it! I must have used it on another project and it’s in a bin but this still worked like a charm. Next, I antiqued all the blocks which warmed up all the colors with some Vintage Photo Distress Stain. 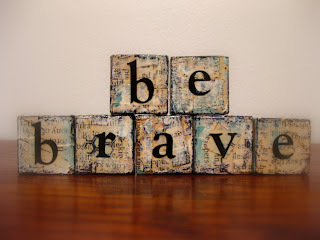 Then I added some letters from my stash to spell out “be brave”. I thought it might be good to just sharpen the edges a bit with Black Soot Distress Ink so each block would stand out. The last step was the Gloss GlueN Seal which will help to keep my blocks protected but also make them easier to dust! 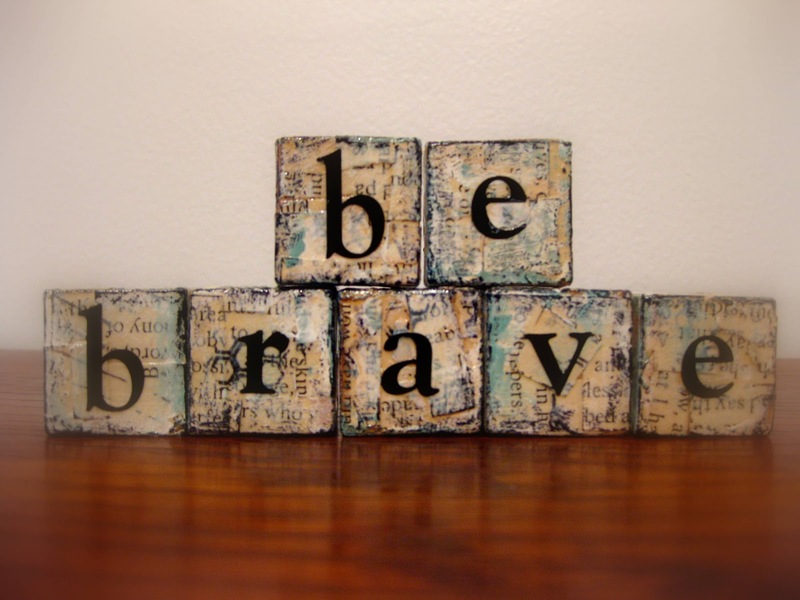 So I’m hoping this little mantra in my studio will remind me to be the brave girl that I am! Love the layers of colors you used. Looks like you had a lot of fun and have made something you can cherish. 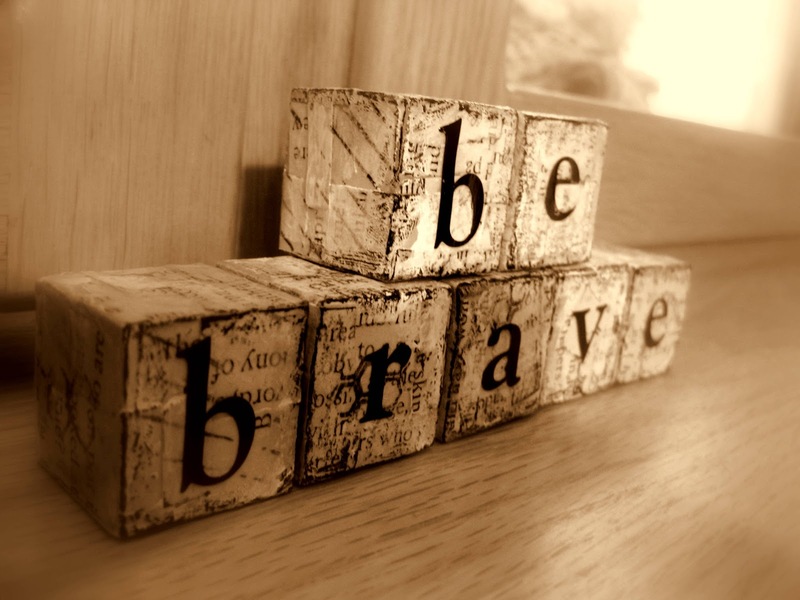 I think we all need to remind ourselves of the need to be brave every now and again. Thanks for the great tutorial. Such a great idea! Very inspiring! Stunning Michelle and a wonderful tutorial of how you created your blocks. Great work!! and thanks for all the new product tips on antiquing. VERY helpful! Love them. I'll look forward to your thoughts on Glue N Seal compared to other products. Love how you use your fingers to paint. This would be cute with the girls names on it to match their room. You are BRAVE. Loved Friday's class, took my book to work to show everyone, everyone loved it. Had it sitting next to my "Happy House". I carry my Happy House to work each night to decorate my work station. If i forget to put it out, i get "where is the happy house". I have a few people who come to look for it when they are having a bad night. I love the blocks so much and the saying has meaning for me too! Excellent instructions! Love how Kim brings her Happy House to work and that people are enjoying it. Art makes people happy!